It’s done! Watch the book trailer for Deadly Glance now! My name’s Jeff Walker. I practice law in Texas, with my partners Bob Wright and Lil Turner. Our latest case looked like a simple question of trade law. Turns out Bob asked one too many questions about the connection between Washington and some organization called World One. The bomb in Bob’s house was a dead giveaway that someone wanted us to stop. When those same people started threatening my friends, I took it personally. Since I was trained by the best of the three-letter agencies, I can handle myself. But when those people threaten the safety of the entire country, I’m not too proud to call in my own private army to mop up this winner-take-all fight. International intrigue; policies and politics. It all comes down to right and wrong in Deadly Glance. Buy your copy now at Amazon! Win a Free, Autographed Copy of Deadly Glance! All you had to do was ‘like’ Dallas Taylor’s Facebook page. Today we chose our winners. We’ll be posting the winners on the Facebook page as well. We ask that you contact Dallas’ assistant, Sue, with your mailing address. You can email Sue with your address at Sue@ChiefVirtualOfficer.com. 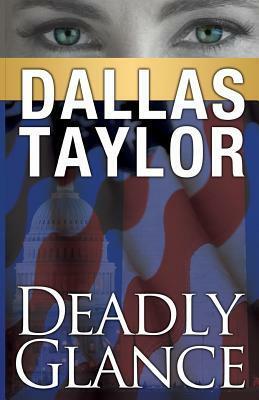 Then Dallas will send you a free, autographed copy of Deadly Glance! After you’ve enjoyed reading your copy of Deadly Glance, we invite you to post a review of it at Amazon and tell all your friends about it. Here’s your chance to win a free, autographed copy of Deadly Glance! On Monday, July 7, 2014, at 10 am CST, we’ll draw at random 10 names from those who have ‘liked’ the Dallas Taylor Facebook page. Those 10 people will receive a free, autographed copy of Deadly Glance! Winners will be notified both here at the blog and on the Facebook page and instructed on how to receive their free copy. So what are you waiting for? Go on over to the Facebook page and ‘like’ Dallas Taylor!